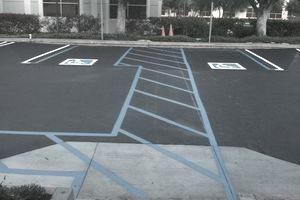 Most commercial construction projects must meet the parking standards outlined by the Americans with Disabilities Act (ADA). The standards generally represent minimum requirements and include guidelines for the number of accessible parking spaces per parking lot size, dimensions of parking spaces, the design of traffic aisles and curb access, and many other accessibility features. Public accommodations and commercial facilities, including multifamily properties, must follow the requirements of the 2010 ADA Standards, including both the Title III regulations at 28 CFR part 36, subpart D, and the 2004 ADAAG at 36 CFR part 1191, appendices B and D.
Access aisles shall be adjacent to an accessible route, connecting parking spaces to entrances. Two parking spaces shall be permitted to share a common access aisle. Avoid using accessible routes behind parked vehicles. If the accessible route crosses traffic lanes, it shall be visibly marked to enhance pedestrian safety. Access aisles shall be at least 60 inches wide and should extend the full length of the parking space being served. Access aisles should be marked to prevent vehicles from parking over the aisles. Aisles must be marked clearly; however, the method and color of marking are specified by state or local law. Aisles may be marked on either side of the parking space; van aisles are recommended to be placed on the passenger side of the van parking space. Aisles shall be at the same level as the parking space they are serving. Level changes are not allowed and constitute a violation of ADA design standards. Aisle slopes not steeper than 1:48 are permitted. Access aisles should be leveled in all directions. Built-up curb ramps are not permitted to project into access aisles and parking spaces because they would create slopes greater than 1:48. Access aisles for car and van parking spaces must be measured from the centerline of the marking line. However, if the parking space or the access aisle is not adjacent to another parking space, the measurement can be made to include the full width of the line. Parking spaces for vans and access aisles and vehicular routes serving them shall provide a minimum vertical clearance of 98 inches. Van parking spaces shall be a minimum 132 inches wide and must contain an access aisle. Car parking spaces shall be at least 96 inches in width. However, van parking spaces may be 96 inches wide only if the access aisle is 96 inches wide. Passenger loading zones must provide a pull-up space of 96 inches minimum width and 20 feet of minimum distance. Loading zones shall not overlap the traffic way. Aisles serving pull-up passenger spaces must be at least 60 inches wide and should extend the full length of the vehicle they serve. Vehicle pull-up spaces, access aisles serving them, and a vehicular route from an entrance to the passenger loading zone and from the passenger loading zone to a vehicular exit shall provide a vertical clearance of 114 inches minimum. Parking space identification must include the International Symbol of Accessibility. ADA Design standards request that signs identifying van parking spaces shall contain the “van accessible” sign. Signs should be installed at least 60 inches above the finish floor surface. Marking passenger loading zones is strongly recommended to prevent vehicles from parking in them. Does Your Firm Need to Post the OSHA 300 Log?